Advantages: Packed with attractive profiles; many unfamiliar and varied subjects; useful compliment to other reference sources; great source of inspiration for modellers; helpful captions describing colours, markings and unusual features. 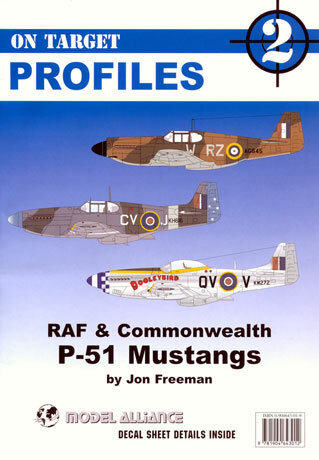 The P-51 Mustang as flown by the RAF and Commonwealth air forces is the subject of Model Alliance's second issue in their new 'Profiles' series. 'Profile' number 2 certainly follows Model Alliance's stated objective of complementing existing material. If anything, it goes further as there is coverage of many aircraft that will not be familiar to nine out of ten Mustang fans. The book consists of 30 pages devoted to profiles covering the aircraft as well as two pages covering the decal sheet that Model Alliance plans on releasing at a later date. Coverage is provided for 76 different Mustangs ranging from Mk 1s through to Mk IVs. Coverage is provided for machines of the Royal Air Force (including the Polish squadrons), Royal Canadian Air Force, Royal Australian Air Force, Royal New Zealand Air Force, and the South African Air Force. The colour schemes span all theatres of WWII, the immediate post-war period, the Korean War and the 1950s. By far the lion's share of profiles are of WWII RAF machines and there are some real surprises here as far as the dispelling of long held beliefs as to exactly how the early Mustangs were painted. There are some real unusual schemes amongst the Mk IVs too. How does olive drab over ANA 602 with blue spinner and anti-glare sound or ocean grey, dark green, medium sea grey with yellow spinner and canopy frame with yellow-outlined squadron codes? The layout of the book is such that, the left hand page shows five side views with the right hand page showing both left and right-hand side views as well as plan views of the upper and lower surfaces of a single machine. Enlargements of squadron badges and any pertinent markings are also included. Detailed text accompanies each profile. The text describes the aircraft's colour scheme using commonly known paint names that modellers will be familiar with. 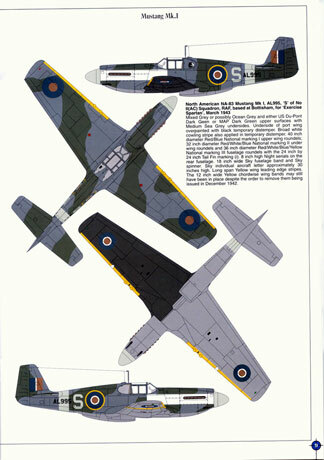 Importantly, the text also guides you through the seemingly myriad variations to RAF roundels and fin flashes. Readers will be familiar with some of the aircraft depicted however; the vast majority of them are illustrated for the first time. This comment is especially true of the latter schemes worn by the Mk 1 Mustangs. The book is printed on good quality A-4 sized paper with stiff cardboard covers The pages and covers are held together with staples. 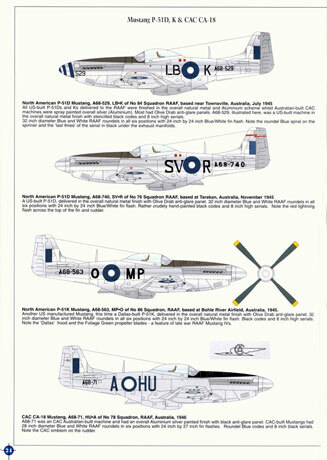 The back cover folds out and the fold-out page has a colour chart of the colours used on the illustrated aircraft. Of special note are the matches to the Du-Pont paint range that were used on the early Mk 1s. If a criticism can be levelled, it would have to be that the colours used for the profiles seem to be a little washed out. Perhaps this is peculiar to my copy as it is a pre-release sample. I would not be surprised if this is the case as the cover illustrations appear to be closer to the expected mark – have a look at the accompanying scans of the pages and compare them to the scan of the cover and you will see what I mean. This is another excellent 'Profile' from Model Alliance. The price is exactly right for what you are receiving. The only downside I see to purchasing this book is the inevitable follow-on costs of the purchase of Accurate Miniature Mustangs and Ultracast early Mustang conversions you will be up for once you have read it and have been motivated into building a few of the illustrated aircraft.